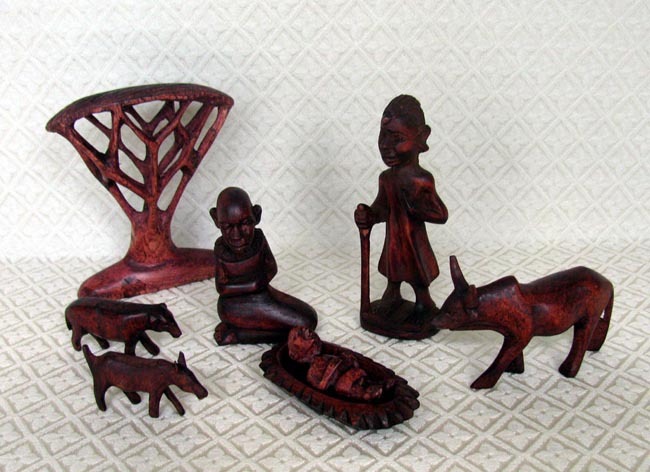 This Kenyan Nativity set is carved from light jacaranda wood by Ndiki Kitui and then stained. The kneeling Mary is bald because, according to the Maasai culture, when a baby is born the mother shaves off all her hair as a symbol that she has conquered or been relieved of a heavy burden. The Maasai live in the African wild of Kenya and Tanzania. The acacia tree measures 5.25 inches tall. The Joseph figure also measures 5.25 inches tall. Acacia trees are characteristic of savanna vegetation and are especially numerous in the South African bushveld. The foliage often appears feathery because of the many small leaflets. This tree is considered sacred in some parts of Africa. Acacia wood was used to build the Ark of the Covenant chest (Ex. 25:10).